Keep your Cleveland area home energy efficient and safe with our extensive maintenance plan. Your Cleveland HVAC system works hard to keep your home or workplace comfortable. Exposed Spiral, Round and Oval Ductwork to give your Cleveland, Ohio home, office or commercial facility the Industrial feel. Our dedicated factory-trained technicians are experts at what they do. From replacing a thermostat to installing an entirely new heating and cooling solution for your home or business, you can trust the team at VENT for all your Northeast, Ohio HVAC needs. For emergencies, we provide 24/7 service for air conditioning system and heating services (additional charges may apply). We accept most major credit cards including Visa, MasterCard, American Express and Discover. In addition, we offer a variety of financing and deferred payment options to meet almost anyone’s budget. Call for details. Vent Heating and Cooling is a trusted HVAC company that provides expert solutions of WHOLE COMFORT EVALUATIONS for homes and businesses throughout the entire greater Cleveland Ohio Community. Using advanced diagnostic instruments and testing procedures Vent will identify heating and air conditioning problems that affect your indoor air quality environment. Starting with an initial consultation, we will do an Equipment, Insulation and Duct Inspection, including an Air Leakage Evaluation and Air Flow Diagnosis. We will show you the overall performance of your home or business HVAC systems and equipment. Vent will also pinpoint the areas of concern and offer the best solution for your air quality and energy efficient systems . 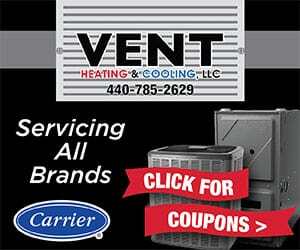 Vent Heating and Cooling has been proudly serving the greater Cleveland area homeowners and businesses for many years. We deliver heating and cooling system solutions with a focus on offering the best value and customer service. Our highly trained technicians are always standing by to assist you whether you have an emergency that needs addressing or simply have questions you want answered by a friendly and knowledgeable professional. I would like to comment on the technician Jacob who came to my home on Memorial Day! Jacob was just great and very knowledgeable. Explained everything I asked with enthusiasm and patience. He did a great job and represented this company with professionalism. I am very grateful for the flexibility and , HONEST service. I for sure will recommend this company to all my family and friends!!!! A+++++ QUALITY!!!! PS: Joe thank you as well for your customer service in returning my phone call PROMPTLY and being so understanding!!!! Called in the evening, the next day they worked around our schedule, had the furnace back up and running in ten minutes. Highly recommended. They have done multiple jobs for me on my home and investment properties! Always professional and very knowledgeable about their trade! I would recommend them to everyone! I use them for all my furnace needs . They always respond very quickly and do excellent work, very knowledgeable and very reasonable price.I highly recommend them. I’ve used Vent twice now and can’t say enough about their prompt professional service. Thank you so much! The best in Business! True professionals, who are honest, and courteous! Absolutely professional, courteous and knowledgable. The best in the business! The BEST HVAC company in the city! Don't hesitate to call Vent!